Human physiological adaptation to the conditions of space is a challenge faced in the development of human spaceflight. The fundamental engineering problems of escaping Earth's gravity well and developing systems for in-space propulsion have been examined for well over a century, and millions of man-hours of research have been spent on them. In recent years there has been an increase in research into the issue of how humans can survive and work in space for extended and possibly indefinite periods of time. This question requires input from the whole gamut of physical and biological sciences and has now become the greatest challenge, other than funding, to human space exploration. A fundamental step in overcoming this challenge is trying to understand the effects and the impact long-term space travel has on the human body. The sum of mankind's experience has resulted in the accumulation of 58 solar years in space and a much better understanding of how the human body adapts. 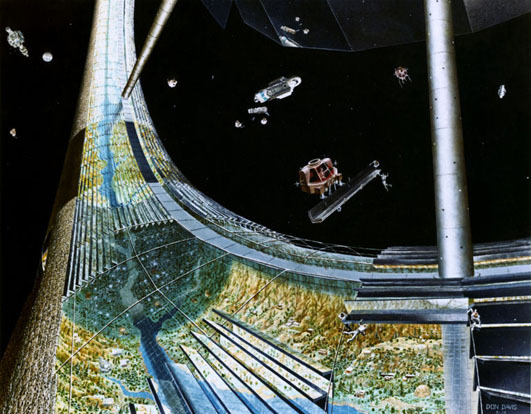 However, in the future, industrialisation of space and exploration of inner and outer planets will require humans to endure longer and longer periods in space. A recent report has highlighted the limits to the quality and quantity of current data, which make it difficult for scientists to extrapolate all the effects of living in space long term. The majority of the data comes from missions of short duration and so some of the long-term physiological effects of living in space are still unknown. A round trip to Mars with current technology is estimated to involve at least 18 months in transit alone. How the human body reacts to such time periods in space is a vital part of the preparation for such journeys. On-board medical facilities need to be able to cope with any type of trauma or emergency as well as contain a huge variety of diagnostic and medical instruments in order to keep a crew healthy over a long period of time, as these will be the only facilities available on board a spacecraft to cope with not only trauma, but also the adaptive responses of the human body in space. Public perception of living in space is generally skewed towards the TV sci-fi of Star Trek where gravity is artificially produced and journeys to distant stars take less than a day. The real-world difficulties of extended space travel are far more complex than those presented in most science fiction novels or movies. The effects of space conditions on humans can be separated into two areas, the physical and the psychological. 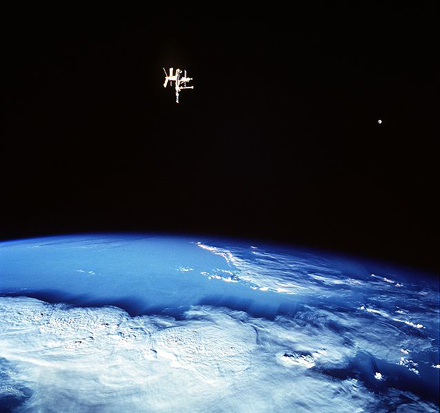 The environment of space is highly dangerous without appropriate protection. The greatest threat is from the lack of pressure in the vacuum environment, while temperature and radiation effects also have an influence. In the low pressure environment, gas exchange in the lungs would continue as normal but would result in the removal of all gases, including oxygen, from the bloodstream. After 9 to 12 seconds, the deoxygenated blood would reach the brain, and loss of consciousness would result. Death would gradually follow after two minutes of exposure—though the limits are uncertain. As shown in the film depiction of Arthur C. Clarke’s vignette in 2001: A Space Odyssey (1968), if actions are taken quickly, and normal pressure restored within around 90 seconds, the victim may well make a full recovery. 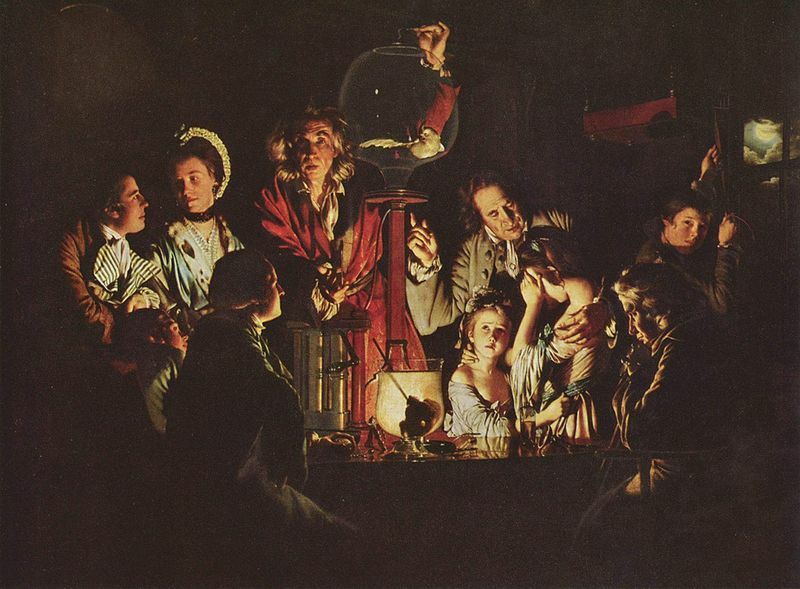 This painting, An Experiment on a Bird in the Air Pump by Joseph Wright of Derby, 1768, depicts an experiment performed by Robert Boyle in 1660. Humans and animals exposed to vacuum will lose consciousness after a few seconds and die of hypoxia within minutes, but the symptoms are not nearly as graphic as the imagery in the public media. Blood and other body fluids do boil when their pressure drops below 6.3 kPa (47 Torr), the vapour pressure of water at body temperature. This condition is called ebullism. The steam may bloat the body to twice its normal size and slow circulation, but tissues are elastic and porous enough to prevent rupture. Ebullism is slowed by the pressure containment of blood vessels, so some blood remains liquid. Swelling and ebullism can be reduced by containment in a flight suit. Shuttle astronauts wear a fitted elastic garment called the Crew Altitude Protection Suit (CAPS) which prevents ebullism at pressures as low as 2 kPa (15 Torr). Rapid evaporative cooling of the skin will create frost, particularly in the mouth, but this is not a significant hazard. A short term exposure to vacuum of up to 30 seconds is unlikely to cause permanent physical damage. Animal experiments show that rapid and complete recovery is the norm for exposures shorter than 90 seconds, while longer full-body exposures are fatal and resuscitation has never been successful. There is only a limited amount of data available from human accidents, but it is consistent with animal data. Limbs may be exposed for much longer if breathing is not impaired. Robert Boyle was the first to show in 1660 that vacuum is lethal to small animals. In 1942, in one of a series of experiments on human subjects for the Luftwaffe, the Nazi regime exposed Dachau concentration camp prisoners to vacuum in order to determine the human body's capacity to survive high-altitude conditions. "At NASA's Manned Spacecraft Center (now renamed Johnson Space Center) we had a test subject accidentally exposed to a near vacuum (less than 1 psi) [7 kPa] in an incident involving a leaking space suit in a vacuum chamber back in '65. He remained conscious for about 14 seconds, which is about the time it takes for O2 deprived blood to go from the lungs to the brain. The suit probably did not reach a hard vacuum, and we began repressurizing the chamber within 15 seconds. The subject regained consciousness at around 15,000 feet [4600 m] equivalent altitude. The subject later reported that he could feel and hear the air leaking out, and his last conscious memory was of the water on his tongue beginning to boil." There has been one recorded incident of death from decompression in spaceflight, the Soyuz 11 decompression accident, in 1971. Cold or oxygen-rich atmospheres can sustain life at pressures much lower than atmospheric, as long as the density of oxygen is similar to that of standard sea-level atmosphere. The colder air temperatures found at altitudes of up to 3 km generally compensate for the lower pressures there. Above this altitude, oxygen enrichment is necessary to prevent altitude sickness, and spacesuits are necessary to prevent ebullism above 19 km. Most spacesuits use only 20 kPa (150 Torr) of pure oxygen, just enough to sustain full consciousness. This pressure is high enough to prevent ebullism, but simple evaporation of blood, or of gases dissolved in the blood, can still cause decompression sickness (the bends) and gas embolisms if not managed. Rapid decompression can be much more dangerous than vacuum exposure itself. Even if the victim does not hold his breath, venting through the windpipe may be too slow to prevent the fatal rupture of the delicate alveoli of the lungs. Eardrums and sinuses may be ruptured by rapid decompression, soft tissues may bruise and seep blood, and the stress of shock will accelerate oxygen consumption leading to hypoxia. Injuries caused by rapid decompression are called barotrauma, and are well known from scuba diving accidents. A pressure drop as small as 100 Torr (13 kPa), which produces no symptoms if it is gradual, may be fatal if it occurs suddenly. In a vacuum there is no medium for removing heat from the body by conduction or convection. Loss of heat is by radiation from the 310 K person to the 3 K of outer space. This is a slow process, especially in a clothed person, so there is no danger of immediately freezing. (Evaporation of skin moisture in the vacuum would cause immediate cooling but only by a very small amount. ) Exposure to the 6000 K radiation from the Sun would lead to local heating that would be well distributed by the body's conductivity and blood circulation. Other solar radiation, particularly ultraviolet rays may cause severe sunburn in a few seconds. Living on earth we constantly feel the gravitational pull and our bodies react automatically to maintain posture and locomotion in a downward pulling world. In microgravity environments, these constant signals the body is adapted to are absent. The otolith organs in the middle ear sensitive to linear accelerations no longer perceive a downwards bias, muscles are no longer required to contract to maintain posture and pressure receptors in the feet and ankles no longer signal the direction of down. These changes can immediately result in visual-orientation illusions where the astronaut feels he has flipped 180 degrees. Over time however the brain adapts and although these illusions can still occur most astronauts begin to see "down" as where the feet are. People returning to Earth after extended weightless periods initially have great difficulty maintaining their balance but recover the ability very quickly, highlighting the remarkable ability of the human body to adapt. Over half of astronauts also experience symptoms of motion sickness for the first three days of travel due to the conflict between what the body expects and what the body actually perceives. The second effect of weightlessness takes place in human fluids. The body is made up of 60% water, much of it intra-vascular and inter-cellular. Within a few moments of entering a microgravity environment, fluid is immediately re-distributed to the upper body resulting in bulging neck veins, puffy face and sinus and nasal congestion which can last throughout the duration of the trip and is very much like the symptoms of the common cold. In space the autonomic reactions of the body to maintain blood pressure are not required and fluid is distributed more widely around the whole body. This results in a decrease in plasma (water in the blood stream) volume of around 20%. These fluid shifts initiate a cascade of adaptive systemic effects that can be dangerous upon return to earth. Orthostatic intolerance results in astronauts returning to Earth after extended space missions being unable to stand unassisted for more than 10 minutes at a time without fainting. This is due in part to changes in the autonomic regulation of blood pressure and the loss of plasma volume. Although this effect becomes worse the longer the time spent in space, as yet all individuals have returned to normal within at most a few weeks of landing. The third and most worrying effect of long-term weightlessness involves bones and muscles. Without the effects of gravity, skeletal muscle is no longer required to maintain our posture and the muscle groups used in moving around in a weightless environment are very different to those required in terrestrial locomotion. Consequently some muscles atrophy rapidly. The types of muscle fibre prominent in muscles also change. Slow twitch endurance fibres used to maintain posture are replaced by fast twitch rapidly contracting fibres that are insufficient for any heavy labour. Bone metabolism also changes. Normally bone is laid down in the direction of mechanical stress, however in a microgravity environment there is very little mechanical stress. This results in a loss of bone tissue approximately 1.5% per month especially from the lower vertebrae, hip and femur. Elevated blood calcium levels from the lost bone result in dangerous calcification of soft tissues and potential kidney stone formation. It is still unknown whether bone recovers completely. Loss of bone and muscle make it very difficult for humans to move and even breathe under the weight of Earth's pull upon their return. The longer the flight, the more loss will occur until it may become impossible for the individual to survive the pull of Earth's gravity for any extended period of time. Weightlessness is not the only factor to affect the human body in space. Without the protection of the Earth's atmosphere and magnetosphere astronauts are exposed to high levels of radiation through a steady flux of cosmic rays. A year in even low-earth orbit results in a dose of radiation 10 times that of the annual dose on earth resulting in a high risk of astronauts developing cancer. High levels of radiation can create 'chromosomal aberrations' in blood lymphocytes. These cells are heavily involved in the immune system and so any damage may contribute to the lowered immunity experienced by astronauts. Over time immunodeficiency results in the rapid spread of infection between crew members, especially in such confined areas. Radiation has also recently been linked to a higher incidence of cataracts in astronauts. Protective shielding and protective drugs may lower the risks to astronauts to an acceptable level, but data is scarce, and longer-term exposure will result in greater risks. Congestion: Microgravity may cause fluid buildup in the sinuses, changing the taste in a similar fashion to holding one's nose while eating. Physical food degradation: Food in orbit is often stored for some months before being consumed. This and the stellar radiation may cause a breakdown in the groups of chemicals that give food its taste, resulting in bland food. Boredom: Menus for the ISS astronauts are planned on a repeating 8-day cycle, which are selected from a menu designed by NASA, and taken into space with the astronaut. This constant repetition may lead to some astronauts getting tired of food that they had previously liked. Psychological changes: The loss of taste may be purely psychological. Astronauts often choose strongly tasting food such as salsa or shrimp cocktail. Studies of Russian cosmonauts, such as those on Mir, provide data on the long-term effects of space on the human body. Other physical discomforts such as back and abdominal pain are commonly experienced with no clear cause. These may be part of the asthenia syndrome reported by cosmonauts living in space over an extended period of time, but seen as anecdotal by astronauts. Fatigue, listlessness, and psychosomatic worries are also part of the syndrome. Data are inconclusive, however the syndrome does appear to exist as a manifestation of all the internal and external stress crews in space must face. The amount and quality of sleep experienced in space is poor due to highly variable light and dark cycles on flight decks and poor illumination during daytime hours in the space craft. Even the habit of looking out of the window before retiring can send the wrong messages to the brain resulting in poor sleep patterns. These disturbances in circadian rhythm have profound effects on the neurobehavioural responses of crew and aggravate the psychological stresses they already experience. The psychological effects of living in space have not been clearly analyzed but analogies on Earth do exist, such as Arctic research stations and submarines. The enormous stress on the crew, coupled with the body adapting to other environmental changes, can result in anxiety, insomnia and depression. According to current data however astronauts and cosmonauts seem extremely resilient to psychological stresses. Interpersonal issues can have an enormous influence on a human's well-being and yet little research has been undertaken to examine crew selection issues in relation to this. The Mars Arctic Research Station and Mars Desert Research Station have examined the influence of different crew selections when living in a completely isolated environment and may provide vital data for future experiences. At the moment only rigorously tested humans have experienced the conditions of space. If off-world colonization someday begins, many types of people will be exposed to these dangers, and the effects on the elderly (except for John Glenn) and on the very young are completely unknown. Factors such as nutritional requirements and physical environments which have not been examined here will become important. Overall, there is little data on the manifold effects of living in space and this makes working to mitigate the risks during a lengthy space habitation difficult. Test beds such as the International Space Station (ISS) are presently being utilized to research some of these risks. The environment of space is still largely unknown, and there will likely be hazards of which we are not currently aware. Meanwhile, future technologies such as artificial gravity and more complex bioregenerative life support systems may someday be capable of mitigating some hazards. Space Physiology and Medicine. Third edition. A. E. Nicogossian, C. L. Huntoon and S. L. Pool. Lea & Febiger, 1993. L.-F. Zhang. Vascular adaptation to microgravity: What have we learned?. Journal of Applied Physiology. 91(6) (pp 2415–2430), 2001. G. Carmeliet, Vico. L, Bouillon R. Critical Reviews in Eukaryotic Gene Expression. Vol 11(1-3) (pp 131–144), 2001. F.A. Cucinotta et al. Space radiation cancer risks and uncertainties for Mars missions. Radiation Research. Vol 156:5 II;pp 682–688, 2001. F.A. Cucinotta et al. Space radiation and cataracts in astronauts. Radiation Research. Vol 156(5 I) (pp 460–466), 2001. Text from Wikipedia is available under the Creative Commons Attribution/Share-Alike License; additional terms may apply.